The United States is a net importer of energy, as in it imports more energy than it consumes. It has been a net importer of energy since the 1950s. There is a strong movement within the country to gain energy independence, especially among supporters who want to have security against global energy supply disruptions and avoid relying on politically unstable regions for energy. Many proponents of energy independence in the United States cite the need to explore the country’s untapped domestic oil reserves as well as removing limitations on oil exploration in the Gulf of Mexico, the Arctic, and the Outer Continental Shelf. However, environmental concerns are strong contenders against increasing oil production and exploration. The United States is currently a net exporter of petroleum products and coal. 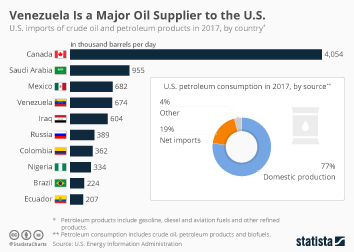 The United States imports petroleum primarily from Canada, Saudi Arabia, Venezuela, Mexico, and Colombia. In 2017, energy imports to the United States reached its lowest level since the 1980s. On the other hand, the U.S. is a net importer of natural gas and crude oil. If the U.S. is to become a net exporter, it is expected that natural gas will become a dominant energy export, primarily to Mexico through a pipeline or to other countries as liquefied natural gas (LNG). It has been projected that, under current conditions, net U.S. energy imports may be eliminated sometime between 2020 and 2030. Under increased oil and natural gas production as well as increased use of renewables, a moderate demand growth is expected to contribute to the United States becoming a net energy exporter. More interesting topics from the industry "Energy & Environmental Technology"